The fifth annual “Masters of Retail Success” event was held on Wednesday, April 5, at the Kahili Golf Course and featured the success stories of four local Maui entrepreneurs. Maui Business Brainstormer’s signature event featured stories by four exemplars from the Maui business community, sharing their knowledge and inspiration with an audience of small business owners from across Maui County. 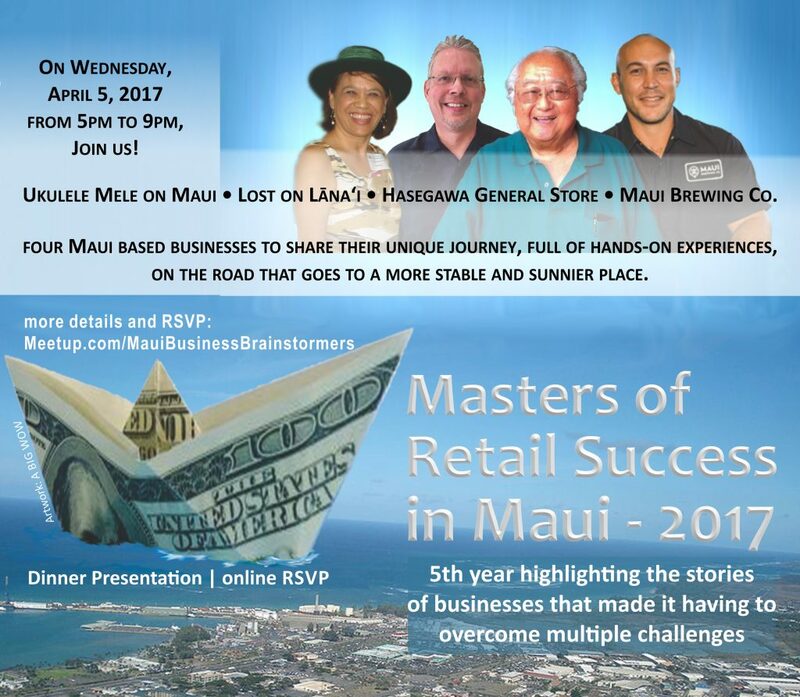 The four local business owners who “talked story” about their road to success and the challenges of running a business on Maui were: Maui Brewing Co. (Garrett Marrero); ‘Ukelele Mele on Maui (Mele Fong); Lost on Lāna‘i (Bradley Bunn); and Hasegawa General Store (Harry Hasegawa). A common theme of the evening, expressed by all four speakers, was the need to follow your personal dream and stay true to your own passion as a business owner. 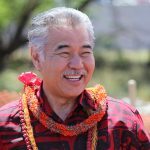 Garrett Marrero expressed this as a focus on authenticity; Mele Fong described the importance of aligning with your own mission; Bradley Bunn began his remarks with the exhortation to “Know Thyself”; and Harry Hasegawa’s stories demonstrated the commitment to a family business through all its ups and downs. All four speakers elaborated on this theme with stories of passion for the business, the desire to make life meaningful through work, the role of “luck” which presents itself in opportunity, and a pervasive focus on the customer. 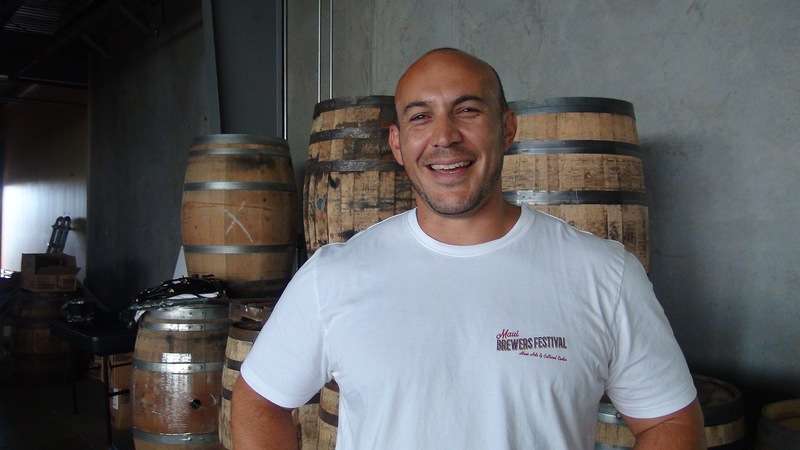 Garrett Marrero, owner of Maui Brewing Company, kicked off the evening by describing his vision for authentic craft beer in Hawai‘i, and the path to becoming Hawai‘i’s largest craft brewery today after the failure of eight other breweries that had started and failed on Maui before he founded Maui Brewing Company. He encouraged attendees to challenge the norm, beat the odds and beat the trends. He gave several examples of obstacles in legislative, funding, and taxation issues that could have stopped him along the way. Instead, he said he was willing to “go down fighting” and was able to change current laws and find creative funding to save his business dream. He emphasized the need for a personal connection with customers, and is proud of his company’s community outreach. His key focus areas in business are authenticity, creating a sense of place, quality, innovation, sustainability, community, and valuing the team. The company’s taglines “crafted with passion from the heart of paradise” and “our ‘ohana, our kuleana” reflect those values. 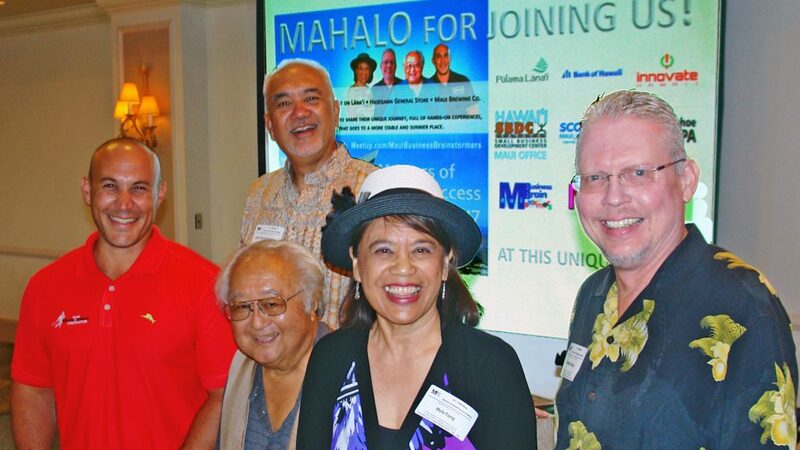 Mele Fong, sole proprietor of ‘Ukulele Maui on Maui, spoke next about her two-prong business approach to education and entertainment. She encouraged attendees to find their own definition of success, and shared that hers includes achieving a mission, having meaningful work, customer recognition, peer recognition, and a balanced life. Her mission statement, “share the joy of making music, one ukulele player at a time,“ is key to her business focus, and allows her to say “no” to distractions and the multitude of choices that might distract from the path to success. Comparing Maslow’s Hierarchy of Needs to a new business’s needs, she pointed out that “challenges are what make life interesting; overcoming then are what make life meaningful.” Fong talked candidly about some of the fears she had had to overcome, always returning to the importance of aligning with her core mission and identifying the unique value of her business. After talking about some key learning points, such as clearly distinguishing marketing versus sales, and how to use social media most effectively, she talked about being conscious of when she is working on her business (strategically) versus working in her business (operational). In summary, she encouraged attendees to focus on why they are in business, to be flexible, to take risks, define success and have fun. Traveling the furthest distance of the four speakers, Harry Hasegawa of Hasegawa General Store in Hāna closed the evening’s program with his remarks. Joining him at the podium was “Rick” Ricardo Medina, retired member of the Maui County Council and former radio personality known as “Da Carabao.” Together, Hasegawa and Medina gave the audience a memory-filled walk through the history of the store in Hāna intertwined with the Hasegawa family history. The theme of luck and opportunity was reinforced again in the story of Paul Weston’s hit song “Hasegawa General Store” and the burst of publicity it gave the Hāna business just when it was needed the most. 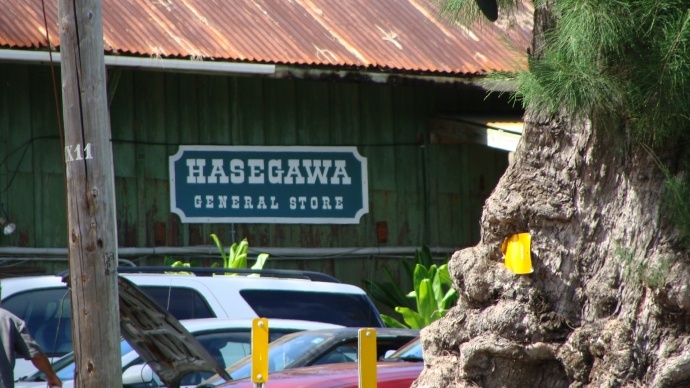 In describing the changes in Hāna from the sugar plantation industry to ranching to tourism, Hasegawa emphasized the importance of knowing your customers, even as their needs change. And he talked about adversity and resilience as he told the audience about the fire that destroyed the original store and the partnership that allowed them to restart the business in the Hāna Ranch Theater, where the store still operates today. Amusing the audience with dean-pan humor, the duo of Hasegawa and Medina acknowledged that even in their 80’s, they still love what they do. And modestly, Hasegawa acknowledged the Lifetime Achievement Maui Small Business Award given to him and his son for their success in Hāna. As attendees mingled and networked at the close of the program, the conversation focused on lessons learned and the common threads of advice across such a diverse sampling of Maui businesses. This popular Maui Business Brainstormers event drew together over 60 entrepreneurs and established businesses from across the community. 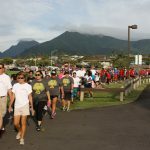 Representatives of two Maui County representatives, Rep. Lyn Decoite and Rep. Kaniela Ing showed their support for local business by attending the event. Two instructors from Kamehameha School’s Business Academy also attended with a dozen students from that program.